Interstate 585 is a short spur from Interstate 85 east into Spartanburg via U.S. 176 (Pine Street). The route connects to its parent via and at-grade connection with U.S. 176 near Lone Oak. The freeway portion stretches southeast from Fairforest Road to the University of South Carolina Upstate (USCS) campus and into Spartanburg by Pinewood Shopping Center. Until 2006, Interstate 585 ended at Business Loop I-85, resulting in a unique situation where the Interstate was disconnected from the rest of the system. While upgrades extended the Interstate standard portion of U.S. 176 northward, the junction with I-85 is not a high speed connection. Exit numbers posted along Interstate 585 utilize the mileposts of U.S. 176 starting from the North Carolina state line. The two routes overlap for the entirety of the freeway, with Pine Street extending south from the freeway end dually as both U.S. 176 and South Carolina 9. A 0.3-mile segment of Pine Street south to Garner Road doubles as Business Spur I-585. An unsigned route since 2004, shields for the designation were posted previously along U.S. 176, including an erroneous I-585 reassurance marker appearing near McCravy Drive. Jim D&apos;Amato, senior transportation planner with Spartanburg County, indicated that transportation planners were working on ramp upgrades and improvements to bring U.S. 176 to Interstate standards in order to tie into Interstate 85. He indicated that "Interstates have to link" in an article published by the Herald-Journal on February 2, 2005.4 The 2006 completed work however left three at-grade intersections, including two at the diamond interchange with I-85. Portions of the original alignment of Interstate 85 through Upstate South Carolina were constructed in the 1940s as a bypass for U.S. 29. The substandard and narrow design through Spartanburg led to the relocated I-85, which was built between 1988 and 1995. Interstate 585 opened as a freeway for U.S. 176 in 1957.1,5 It was built in conjunction with projects to upgrade the U.S. 29 bypass of Spartanburg to Interstate 85. 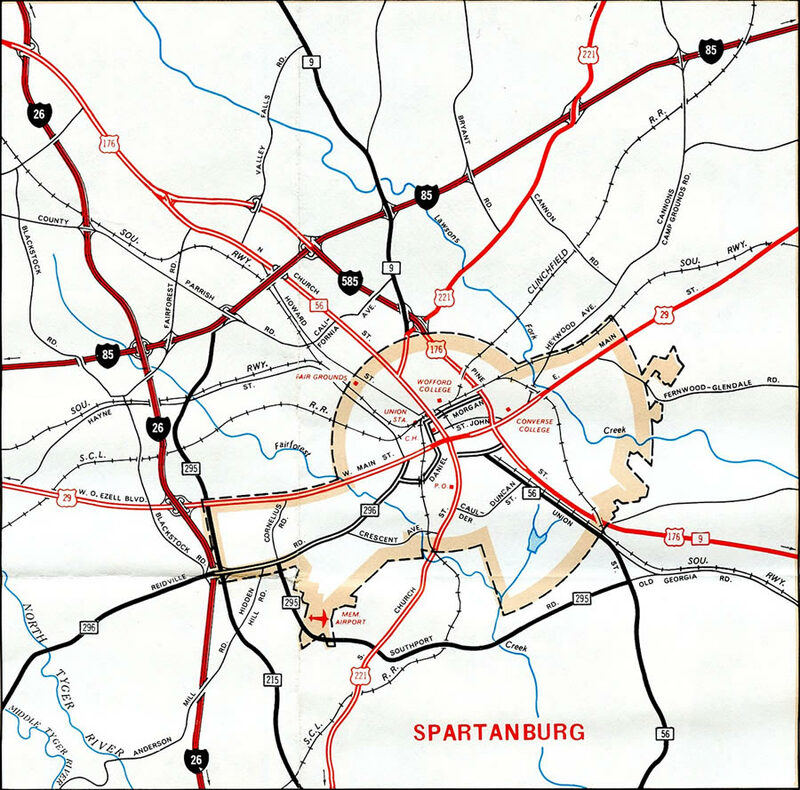 Movement to relocate Interstate 85 away from Spartanburg onto a new alignment in 1983 led to a Spartanburg Area Transportation Study (SPATS) committee vote in 1984 pertaining to area highways. The SPATS recommendation to the South Carolina Highway Department included an access improvement plan for both Interstate 585 and Asheville Highway (S.C. 56). 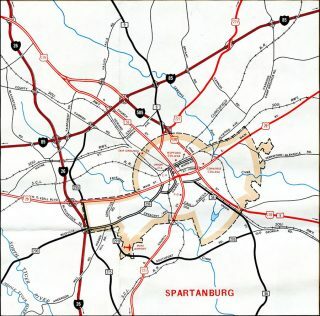 A study presented to Spartanburg City Council in May 1984 recommended designating both I-585 and S.C. 56 as primary routes to and from the Spartanburg central business district while renumbering the old I-85 as Interstate 285 once the new alignment for I-85 opened to the north. Improvements proposed for I-585 and S.C. 56 included new way finding signs for Uptown Spartanburg, extending street lighting, replacing the Hearon Circle with a diamond interchange and building a half cloverleaf interchange between Pine Street (Business Spur I-585 / U.S. 176) and McCravy Drive. The SPATS committee however differed on city council study, suggesting the highway department consider an alternative to the McCravy Drive interchange.10 Upgrades at Hearon Circle or for Pine Street at McCravy Drive were never implemented. Prior to 1995, Interstates 85 and 585 met directly at the cloverleaf interchange by the Milliken Arboretum. Opening during August of that year was the new alignment for I-85 taking the route further north from Spartanburg. This left the old alignment as Business Loop I-85 due to its substandard design. Interstate 585 north & U.S. 176 veer west from the diamond interchange with Valley Falls Road to reach Interstate 85. A lane drop occurs in one mile at the northbound on-ramp for Charlotte. Photo taken by Carter Buchanan (01/16/16). An signalized intersection precedes the Interstate 585 and U.S. 176 ramps with Interstate 85 at Fairforest Road. There are no plans at this time to eliminate this crossing or build high speed ramps with the adjacent freeway. Photo taken by Carter Buchanan (01/16/16). A conventional diamond interchange joins the nroth end of I-585 and U.S. 176 (Pine Street) with Interstate 85. U.S. 176 proceeds west to overtake S.C. 56 along Asheville Highway leading north to Dodd Hill and the city of Inman. Photo taken by Carter Buchanan (01/16/16). New signs installed in 2006 at the Valley Falls Road off-ramp referenced both Charlotte and Greenville for nearby Interstate 85. The overhead was amended not long afterwards to reference Charlotte only with a greenout added over Greenville. Photo taken by Carter Buchanan (10/28/06). This set of overheads at the northbound I-85 on-ramp were replaced after 2011. Traffic signals were added here by 2011 as well. Photo taken by Carter Buchanan (10/28/06). U.S. 176 (Pine Street) branches east from Asheville Highway (South Carolina 56) to quickly meet Interstates 85 and 585 at a diamond interchange. Photo taken by Carter Buchanan (01/16/16). Interstate 85 leads motorists southwest from U.S. 176 (Pine Street) toward Duncan, Greer and Greenville. Photo taken by Carter Buchanan (01/16/16). Crossing over I-85, U.S. 176 (Pine Street) reaches the northbound on-ramp to Gaffney, Kings Mountain and Charlotte, North Carolina. Traffic lights were added here by 2011. Photo taken by Carter Buchanan (01/16/16). A lone U.S. 176 reassurance marker stands beyond the I-85 north side ramps. The freeway formally begins after the traffic light with Fairforest Road, but the first shield for I-585 does not appear until after Business Loop I-85. Photo taken by Carter Buchanan (01/16/16). Leaving the cloverstack interchange with Interstate 26, Interstate 85 winds under New Cut Road and a Norfolk Southern Railroad line to meet the north end of Interstate 585 and U.S. 176 (Pine Street) at a diamond interchange (Exit 72). Photo taken by Carter Buchanan (01/16/16). Exit 72 departs I-85 north for U.S. 176 (Pine Street) west to Inman and Interstate 585 & U.S. 176 east to USC Upstate and Spartanburg. The initial stretch of I-585 travels at-grade, with signalized intersections both at the ramps to I-85 and at Fairforest Road nearby. Photo taken by Carter Buchanan (01/16/16). All signs along Interstate 85 north from the split with Business Loop I-85 to the North Carolina state line were replaced in 2012. Signs for Exit 72 were carbon copied and still reference the connection with I-585 via U.S. 176 east, rather than as an overlapped route. Photo taken by Chris Patriarca (04/06/03). Passing underneath South Carolina 56 (Asheville Highway), the Exit 72 ramp for U.S. 176 east to Interstate 585 departed. The next northbound interchange is with South Carolina 9 in three miles. S.C. 9 also has an interchange with Business Loop I-85 and a brief overlap with Business Spur I-585 in Spartanburg. Photo taken by Chris Patriarca (04/06/03). One mile north of U.S. 176 (Exit 72) on Interstate 85 southbound. The divided highway links Inman and Interstate 26 with Downtown Spartanburg via South Carolina 56 or Interstate 585. Signs for U.S. 176 and I-585 were replaced by 2012. Photo taken by Chris Patriarca (04/06/03). Upper Valley Falls Road spanned Interstate 85 as Exit 72 departed southbound for U.S. 176 (Pine Street) and Interstate 585 south. Photo taken by Chris Patriarca (04/06/03). Interstate 585 north ran along the Milliken Arboretum and Chinquapin Creek to end at a three-quarter cloverleaf interchange (former Exits 23B/A) with Business Loop I-85. Photo taken 06/22/05. Milliken Road parallels the east side of I-585 to Exit 23B with Business Loop I-85 north. Slip ramps connect the adjacent frontage road with both I-585 west and Business Loop I-85 north. Photo taken 06/22/05. Replacement signs posted at Business Loop I-85 on I-585 west by 2006 omitted the exit numbers. The original Interstate 85 freeway merges with current I-85 in three miles, 29 miles south of the North Carolina state line. Photo taken 06/22/05. A loop ramp (old Exit 23A) carried motorists from the former end of I-585 west onto Business Loop I-85 (Veterans Parkway) southbound. This Business Loop Freeway is one of three full-freeway business loops in the country. The other two are Business Loop I-80 in Sacramento, California, and Business Loop I-40 in Winston-Salem, North Carolina. Photo taken by Carter Buchanan (09/24/04). Northbound Business Loop 85 at Exit 4 to South Carolina 56 (Asheville Highway). S.C. 56 provides the connection with U.S. 176 west in place of a direct connection at the nearby three-quarter cloverleaf interchange (Exit 5A). Sign changes made here after 2008 separated I-585 south from U.S. 176 east while correcting Exit 4 to reflect S.C. 56 to U.S. 176. Photo taken by Chris Patriarca (04/06/03). Exit 5A departed for Interstate 585 south & U.S. 176 east into Spartanburg. This interchange was overhauled by 2006 to improve ramp geometry and bring U.S. 176 to Interstate standards. Photos taken by Chris Patriarca (04/06/03). Southbound Business Loop I-85 at Exit 5B for U.S. 176 west. Prior to 2003 road work, U.S. 176 was a divided surface highway from here north to I-85, with an interchange at Valley Falls Road. Photo taken by Chris Patriarca (04/06/03). Exit 5A looped away from Business Loop I-85 south onto the southbound beginning of Interstate 585. Photo taken by Chris Patriarca (04/06/03). U.S. 176 previously ran between two frontage roads south from a folded diamond interchange with Valley Falls Road to Business Loop I-85 (former Exits 23A/B). I-585 now travels along this stretch with up to seven overall lanes. Photo taken by Chris Patriarca (04/06/03). Interstate 585 began as U.S. 176 southbound reached Exit 23A to Business Loop I-85 south. Photo taken by Chris Patriarca (04/06/03). The final southbound off-ramp for I-585 joins South Carolina 9 (Boiling Springs Road) north, Church Street south and adjacent U.S. 221 (Whitney Road). U.S. 221 runs north along Whitney Road toward Cherokee Springs while overtaking Church Street south to Downtown Spartanburg. Photo taken by Carter Buchanan (01/16/16). A new ramp was completed by 2006 to separate departing traffic to U.S. 221 from traffic merging onto I-585 south & U.S. 176 east from S.C. 9. This change provided direct access to Boiling Springs Road (S.C. 9) north. Photo taken by Carter Buchanan (01/16/16). S.C. 9 south combines with U.S. 176 east along Pine Street as Exit 25B lowers to meet U.S. 221 (Whitney Road). Prior to 2006, Exit 25B departed here from the I-585 mainline directly. Photo taken by Carter Buchanan (01/16/16). Interstate 585 ends unceremoniously as U.S. 176 east & South Carolina 9 transition into a six-lane commercial boulevard. Until 2004, signs referenced the next half mile of Pine Street also as Business Spur I-585. Photo taken by Carter Buchanan (01/16/16). Original button copy sign posted for the diamond interchange (Exit 25B) with U.S. 221 (Whitney Road) on I-585 south & U.S. 176 east. Photo taken 06/22/05. This shield assembly for I-585 was posted beyond the freeway end across from Pinewood Shopping Center and adjacent to Chinquapin Creek. It was removed when the third southbound lane was extended to the U.S. 221 on-ramp. Photo taken 06/22/05. A remnant from when Business Spur I-585 was posted along Pine Street, this set of shields including I-585, stands along the at-grade stretch of U.S. 176 & S.C. 9 ahead of McCravy Drive. Photo taken by Carter Buchanan (01/16/16). The initial guide sign for Interstate 585 west appears before the entrances to Pinewood Shopping Center and an adjacent car dealership. A split diamond interchange follows with U.S. 221 (Whitney Road) and the departing S.C. 9 north to Boiling Springs Road. Photo taken by Carter Buchanan (01/16/16). U.S. 221 leads north 14 miles from Exit 25B to the city of Chesnee as Interstate 585 begins. Photo taken by Carter Buchanan (01/16/16). "Millions aid Spartanburg traffic flow." Herald-Journal (Spartanburg, SC), December 6, 2007. "Project will smooth rough intersection." Herald-Journal (Spartanburg, SC), February 2, 2005. "Pine Street lane closures announced to demolish California Avenue Bridge." Herald-Journal (Spartanburg, SC), June 26, 2014. "Work continues on Interstate 585 bridge." Herald-Journal (Spartanburg, SC), February 2, 2015. "Highway 9 bridge reopens to traffic after being closed for repairs." Herald-Journal (Spartanburg, SC), June 19, 2015. Project Information – US 176 Corridor Improvements, Project Identification Number: 0039714RD01. SCDOT web site. "Asheville Highway, I-585 Access Improvements Recommended." Herald-Journal (Spartanburg, SC), June 16, 1984. Page updated January 30, 2019.